On August 2, 2014, the 7th Annual Petaluma Music Festival at the Sonoma-Marin Fairgrounds successfully raised over $33,000 of much-needed funds for Petaluma area public school music programs. More than 3,600 people attended the festival to hear music artists such as Galactic, The Mother Hips, Brokedown in Bakersfield, and Sister Sparrow & The Dirty Birds. “The event was again a tremendous success, and we would like to thank our sponsors, volunteers, attendees, and musicians for helping us keep music in our Petaluma schools,” said Mark Mooney, President of the music festival’s Board of Directors. The Petaluma Music Festival has now donated over $125,000 to Petaluma area public schools in the last 5 years. In addition to the revenue generated by the 2014 Festival, organizers are especially pleased that every dollar donated in sponsorship was once again donated to the schools. The 8th annual festival will take place on August 1st, 2015 and festival board members expect revenue and attendance will increase and the festival will be able to donate even more to local schools. The Petaluma Music Festival is an incorporated 501(c)3 non-profit organization whose mission is to keep music in our Petaluma public schools. The Board of Directors believe passionately in the positive influence of music in children’s lives, and want to ensure school music programs have a consistent and lasting funding source. The Petaluma Music Festival strives to promote music education and youth participation in music activities in the greater Petaluma area, and to supplement and augment the services of our local public schools. 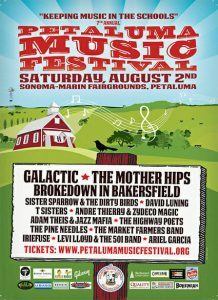 For more information about the Petaluma Music Festival, please visit www.petalumamusicfestival.org.